Branding can seem like the last thing you need as a solo freelancer when you are juggling everything else. Liz Dennery Sanders explains why it is so important to focus on your branding, how it can help your career and your bank balance! Which is why it is worth giving it some focus. I had such a fun time chatting to Liz about branding. Liz has been in the business for 25 years working in marketing, branding, creative direction and PR. She has worked with iconic brands like Escada, Elyse Walkwe and Serena Williams, and many more. We recorded a podcast so that you could share the top tips and knowledge Liz has about branding and style. Liz is the author of ‘Style & Substance: How to Create A Compelling Brand’. It is a fantastic guide and workbook for women who want to build their confidence, their brands and their bank account. It is something that I wish had been around when I was starting out. If you are quick and buy a copy of the book via Liz’s website www.shebrand.com/book you can also grab $1000 worth of extra goodies. I’m not affiliated with this book in anyway, I’m sharing the love of a great product that can help you with your creative career. What I love about Liz’s message is that “women can rise higher using their voices, growing their influence and businesses, and in doing so shatter the glass ceiling and old perceptions about what a women is capable of being and doing”. We can do this! Let us know in the comments what your branding issues or loves are at the moment. 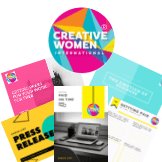 Remember to sign up to the Creative Women International newsletter to get these podcasts and tips land in your inbox before anyone else. Plus there are some goodies you get for signing up too! Previous Post: Take away the guilt.